The 2016 Winter Festival PARADE scheduled for this Saturday, January 30, is cancelled due to winter storm related issues, snow and ice, and the availability of participants. It will not be re-scheduled. We hope that everyone will come out to enjoy our beautiful snow covered River Towns of Lambertville and New Hope this week and on the weekend, and will check out our many fantastic Winter Festival events that are taking place. Starts at the New Hope Solebury High School, New Hope, PA, moves East on Bridge Street and crosses the Free Bridge into Lamberville, NJ. 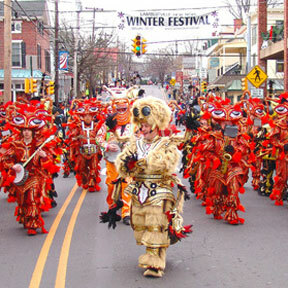 Every year the Winter Festival Parade links the twin river towns of Lambertville and New Hope with a fantastic display of music, creativity and talent. Come see Mummers bands, marching bands, creative floats, dancers, jugglers, community groups all contributing to the festive atmosphere! You can view the parade on the bridge or anywhere along Bridge St. in Lambertville or New Hope.